About Us | West Oahu Roofing Inc.
West Oahu Roofing was established with the purpose of providing quality and affordable services to the residents and businesses of Hawaii. West Oahu Roofing is a family owned and operated business. We take pride in our workmanship and treat every customer’s home or business as if it were our own. Our reputation of professionalism, quality, and attention to detail is what drives our success from referrals and repeat customers. West Oahu Roofing, Inc. is one of the fastest growing roofing contractors; servicing a wide range of homeowners, property management companies, realtors, and general contractors. West Oahu Roofing, Inc. is a fully licensed, insured, and bonded business. With over 20 years of experience in the residential and commercial roofing industry, we average nearly 300 homes of roofing work annually, ranging from new roofs to re-roofs and repairs. Since 2006, our company has been a member of the Better Business Bureau (BBB) with an A+ rating. We provide service on not just Oahu, but also on the neighbor islands. 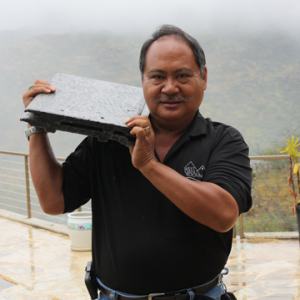 Mr. Bernard C. Balais, President and RME of West Oahu Roofing, Inc. has been in the roofing industry since 1993. He has worked as the Operation’s Manager and Salesman at International Roofing & Building Construction Inc. (1993-2003) overseeing all residential and commercial roofing projects. Prior to his start in the roofing industry, he was the Operation’s Manager at the former Kilgo’s Hardware Store. Venturing off on his own, he started West Oahu Roofing, Inc. in 2004 and has taken the knowledge he has gained to expand this company. Mr. Randall Balais of West Oahu Roofing, Inc. has been with the company since it started in 2004. Starting from the bottom up, he has gained a vast knowledge of the roofing industry from a hands on approach. Alongside his hands on experience, he is also a recent graduate of the University of Hawaii at Manoa College of Civil Engineering, with a degree in Civil Engineering. He works both in the office and on site to work one on one with the customers and employees to ensure a full circle of satisfaction.